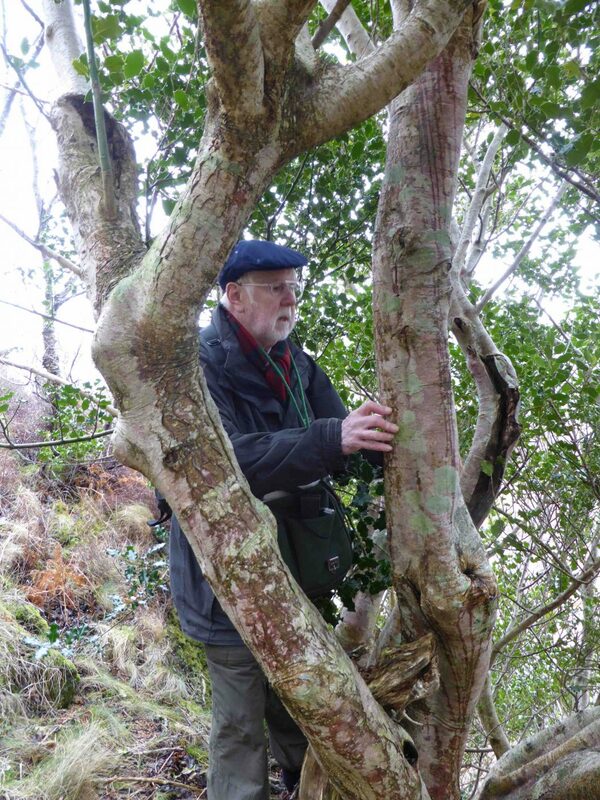 On 8thApril 2018, lichenologist Dr Tony Fletcher, a regular visitor to Assynt, accompanied Gwen Richards and Ian Evans on a third trip to Torr Mor (photo 1). Attention was focussed on the lichens of the hazel groves, as a contribution to Roz Summers’ Atlantic Hazel Woodland Audit, and the visit proved very productive. 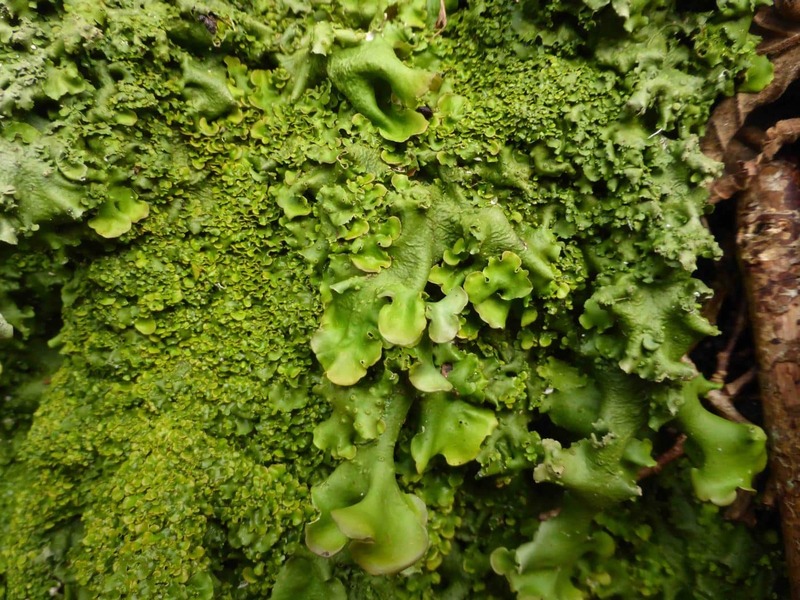 Some of the older stems had profuse coverings of members of the Lobarion and Graphidion communities, including the less common lungwort Lobaria virens (photo 2) and the reddish dots of Arthoni acinnabarina (photo 3). Tony also recorded from holly, rowan, downy birch, oak, the well-lit boulders in some of the south-facing glades and shadier rock-faces elsewhere. 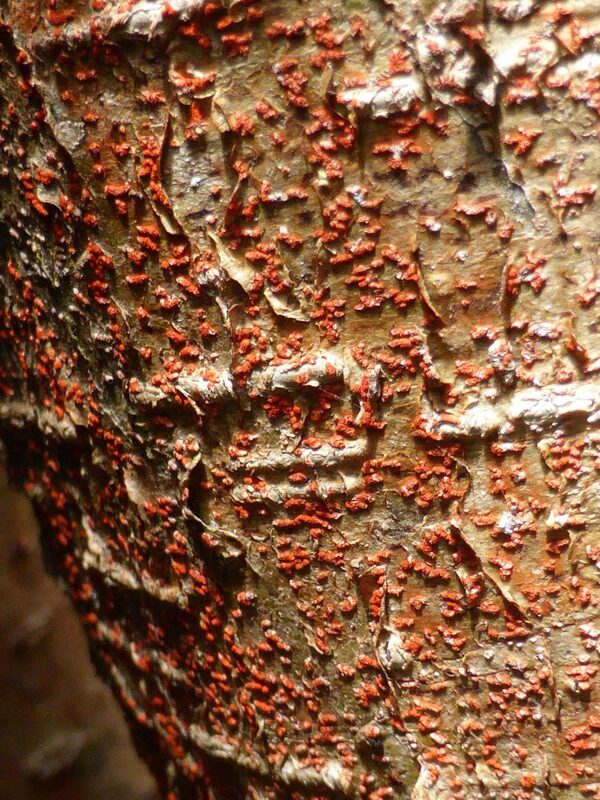 The corticolous lichens alone amounted to some 86 species, including ones particularly associated with hazel such as Melaspilea atroides, Pyrenula laevigata and Pyrenula macrospora. We were again impressed, on this visit, by the amount and excellent condition of the hazels along the southern margins of the woodland at Torr Mor, perhaps the only place where this tree occurs on Little Assynt, certainly in quantity. Incidental observations on this visit included the tree slug Lehmannia marginata and two leafhoppers which accidentally drowned themselves in Gwen’s lunchtime cup of tea and were later identified by Stephen Moran as immature Verdanus sp.